Chicago residents Michael and Kama Rannells looked across the country for a small town with a slower pace that was appealing and affordable at the same time. They were in their fifth year of searching when the couple decided on Paducah after reading an article in the Chicago Tribune on the Artist Relocation program. Both had successful jobs in the city but wanted to create something that they could do together. 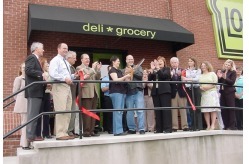 After querying the locals in Paducah, the couple decided a neighborhood deli and grocery offering gourmet, ethnic, and organic foods would be a perfect addition to downtown. To their delight, their proposed store qualified for redevelopment loans. In early 2005, Rannells purchased St. Mary’s Academy and spent 8 months with renovations. Now busy every day, Loaf covers all the basics of a grocery store, but offers a wide assortment of gourmet and ethnic foods and ingredients unobtainable in the past in Paducah. The deli section of Loaf serves lunch daily, offering gourmet sandwiches, salads, and soups. As their counselor, Grossman talked over ideas with them and the Rannells attended several of SCORE’s business workshops. Grossman also brought in counselor Bob Leventry to talk to the couple about organic foods, a specialty of his. Grossman and the Rannells’ envisioned the “organic food” slant would appeal to a target market of artists and tourists, including those interested in the area’s famous quilts. In fact, there was a pent-up demand by the business community for wholesome foods in a nice setting. Loaf’s owners are delighted to see business customers, who have more potential to be regular patrons. Even with 8 employees, the Rannells are hiring. “Business is unbelievable, and we’ve found a real niche” says Kama Rannells. So on your way to a Paducah quilting bee, stop by for a sandwich at Loaf, or check out their website.